Cambrex was approached by a US-based biotechnology company to develop a process for producing a highly potent API, a DNA alkylator, used to treat an unmet oncology need. The biotechnology company had limited experience in the development and manufacture of high potency compounds and sought a reliable partner for the pre-clinical development and clinical trial material manufacture, which could possibly advance to commercial manufacture, if approved. Cambrex has been successfully developing and manufacturing pre-clinical to commercial scale quantities of high potency APIs (see chart) since 1998 and uses a data-driven Occupational Exposure Limit (OEL) assessment for compounds of unknown toxicity. While reviewing the toxicological data of the highly potent compound, the development team, in conjunction with a board certified toxicologist, discovered the compound to be “ultra-highly” potent (1-10 ng/m3 OEL – a low nanomolar range) that is orders of magnitude more potent than previously handled at any Cambrex facility. A cross-functional high potency team, including experts in chemistry and toxicology, worked closely with the customer to ensure that Cambrex was able to safely and effectively develop and manufacture the compound. Cambrex utilized its High Potency Development Center (HPDC) to develop the compound, now classified ultrapotent. The HPDC is a controlled-access facility with barrier isolation, airlocks and cascading air differentials and is equipped to handle low ng/m3 OELs. However, to meet the ultra-high potency demands, some additional modifications were made to ensure containment to very low ng/m3 OEL levels. The chromatography purification of the compound was fully contained during the execution of the cGMP manufacturing of the ultra-high potent product. The barrier isolation technology was improved with the addition of a bag in/bag out system, allowing for contained sample handling and product movement within production areas. Protocols and procedures for cleaning validation and work flow were revised to meet the challenges of working with the ultra-highly potent compound. 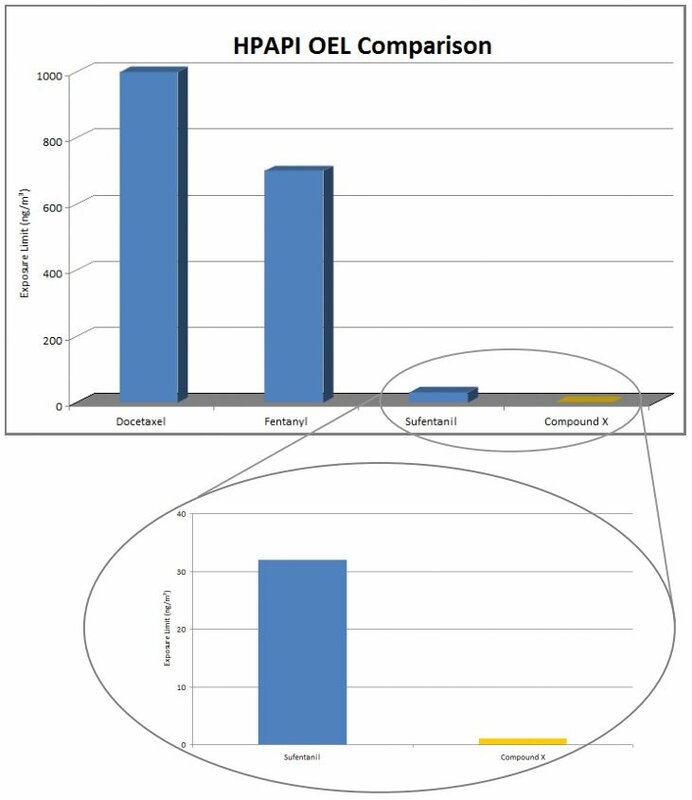 SafeBridge® Consultants, Inc., specialists in potent compound safety, including developing sensitive industrial hygiene analytical methods for highly potent compounds, analyzed the surface samples, using validated analytical methods, to verify that the cleaning methods Cambrex implemented were effective in removing the highly potent compound from work surfaces. Cambrex exceeded the customer’s expectations for safety, yield and product quality. Additionally, Cambrex was able to meet a very challenging production timeline that had very limited flexibility. The Cambrex team led the way, keeping all parties updated and educated on the safety requirements, process upgrades and how to handle, decontaminate and clean equipment. Experts in the area stated it was one of the “top three most potent molecules” they had seen. The success of this project demonstrates that Cambrex is a knowledgeable and experienced resource for future ultra-high potency development and manufacturing services. The chart below shows the exposure limits for various high potency compounds that Cambrex has safely developed and manufactured, including the compound for the biotechnology company mentioned above. During review from the board certified toxicologist and development team, Compound X was revealed to be an “ultra-potent” compound, with an OEL in the low nanomolar range. Cambrex was approached by a top 10 Asian pharmaceutical company looking to partner with a contract manufacturing organization (CMO) with commercial manufacturing capabilities and expertise, mid- to large-scale cGMP assets and exemplary quality systems and US FDA track record.